I never want to draw a colorful line representing a book again. Two things, first I saw you talking about font in the last comic’s comments and was going to ask something myself, what method (like program or website) do you use to make a font? Secondly, the Second would probably fit right in with a final boss room that doubles as a library. I get all my fonts from websites, my favorite being dafont.com. I make sure to use ones that are public domain, or 100% free for personal and commercial use. Some fonts need to be paid for, or the creators at least don’t want you using them on stuff that makes money (and we do hope to sell books eventually). Yeah, the Second and Bladud were not too far apart in age; I wonder if they ever talked. Of course, it wasn’t a library then. Thanks, I’ll probably go with the using public domain/free fonts. I was thinking of translating my own handwriting but mine isn’t that good in the first place. It’s impressive you’ve hand written any of it, especially a central character like Derk. Yeah, I couldn’t find a font that I thought was really Derky enough. I kind of regret it now though, as it’s been a huge pain! Not to say that I should have found a font, but I should have tried to make my own font out of “Derk’s voice” sooner. There are some comic artists that hand-write their words, but unless you’re doing something really interesting with the way you portray speech, I would not recommend. I made a font out of my handwriting using myscriptfont. It gives you something to print but I just did it digitally. Something janky happened with the line spacing of it, but it was alright. It was strangely eerie typing it out, I could tell immediately that it is my handwriting. Didn’t take too long to make, and the website gave me one of those font files to whack into the appropriate place on my computer. did he just…climb over the little guard ribbons? He didn’t knock them down. Yeah, I thought about not putting the ribbon, but then felt someone might point it out as an inconsistency. I like to imagine he just ran and jumped over them. Or maybe he dashed up, and carefully stepped over the cord and then sat down. I like to imagine the books and bean bags were donated by surface-level Idenian charities. They should donate some new clothes for these guys, though, for real. Oh Skarva, such a law abiding citizen. Not that books aren’t bad, too–I’ve just been drawing more grass than books of late: at least three images that I’ve worked in recently included a fair bit of grass, and it was a pain. Anything natural I have fun with, even though grass and trees could potentially be tedious, there’s enough leeway there because it doesn’t have to be perfect. It’s like Bob Ross said, trees don’t make mistakes, they just grow whatever way they like! Or something to that effect. With anything repetitive and man-made, you can’t have as much fun. I’ll admit that the repetitiveness of man-made structures can be tiresome. Even so, the sheer number of blades in a region of grass can make them painful to me–especially if (as in one recent picture) they’re limited in their patterns of growth by other factors, meaning that heedless painting may result in grass appearing where it shouldn’t. Of course, it may be at least in part that I simply don’t yet have a decent method of painting grass, leaving me with the tedious approach. 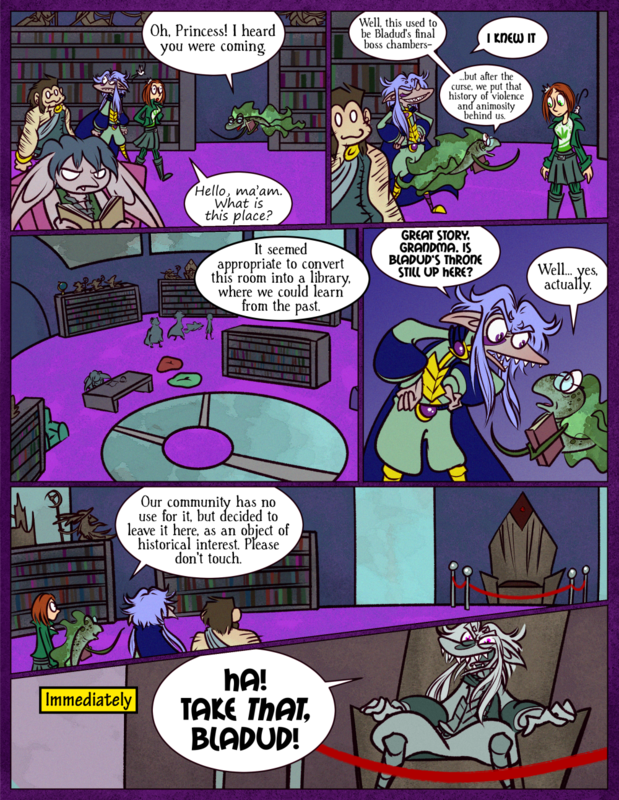 Since this comic was inspired by video games, would that render that seat a Throne of Games? Of course, in this case Skärva is somewhat Gaming the Throne. Come to think of it, I suppose that this room still held a boss-battle: you vs. the coloured book-lines. I do have one (fairly minor) point of critique, if I may: in the last panel, the back of the throne appears to have suddenly become skew, and–to my eye, at least–it looks as little off. Yeah, I did the throne thing on purpose; I thought it looked more dynamic if it was at a weird angle like that. But if it’s not coming across as anything more than me forgetting the throne I just designed, I can fix it. 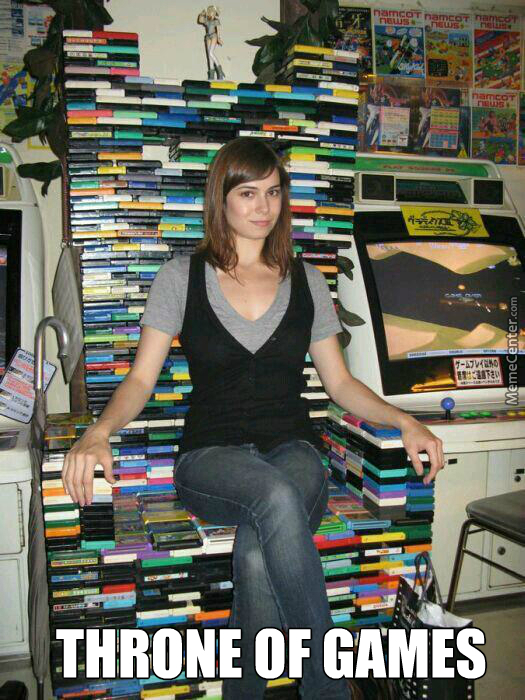 Throne of Games, you say? Hmm… I do see what you’re going for, I believe. I think that the problem may be that the top of the throne also suddenly has parallel sides, where before it tapered towards the bottom. I suspect that if you moved the bottom-end of the left-hand edge of the throne-back towards the right a little, the result would look as you intend: the throne dynamically skewed. As to the throne, that is incredible! Well done indeed to that lady! If this was a video game, I have a feeling a cut seen of the ghost of Bladud would appear possessing Skarva after he sat down on the chair and a boss fight with Derk and the Princess would start. I was actually guessing the same thing. Holy crap, that’s cool! You guys are going to be disappointed, but I hope not too much, because exciting things are going to happen. But not that. …I kinda do want to draw that now, though.